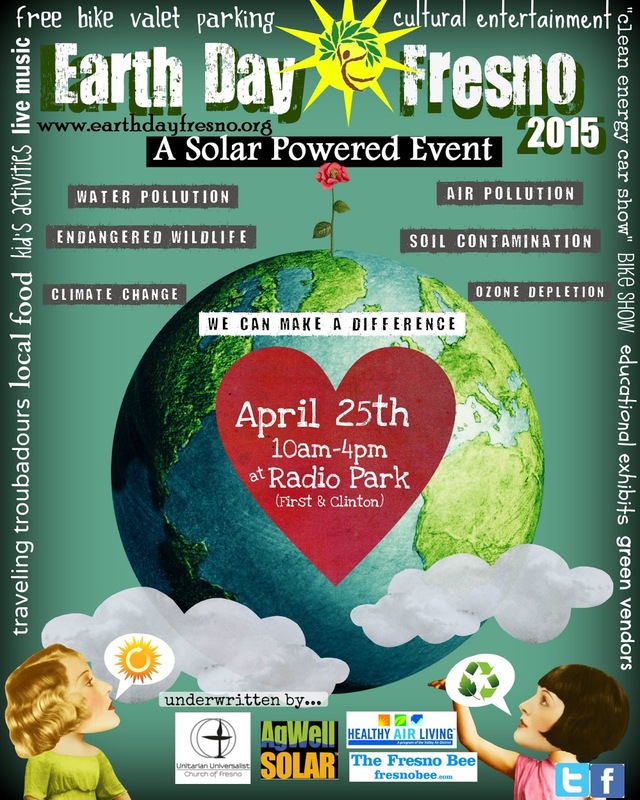 Fresno, CA, April 14, 2015– Earth Day Fresno will be held on Saturday, April 25th at Radio Park from 10am to 4pm. This free community event will feature something for everyone! Visitors will learn about recycling, composting, reducing air pollution, solar energy and lots more. There will be hands-on exhibits and vendors of Earth-friendly goods and services. For the first time, Earth Day Fresno will have a bike show featuring commuter and family bikes which are great alternatives to cars. The Fresno County Bicycle Coalition is leading a bike ride to the event. Cyclists will enjoy free valet bike parking by I Bike Fresno. Pedal Junkies will give kids free cargo bike rides. Car buffs will see the latest in renewable energy technology, including Teslas, a plug-in hybrid an electric school bus and other unique clean energy vehicles. No Earth Day festival is complete without live music and delicious food provided by popular local food vendors. There will be lots of children’s activities including games, crafts and the Fresno County Library Bookmobile. Free recycling will be provided for used pens and broken or outdated electronic devices. The entire event will be powered by the clean, quiet energy of the sun. Earth Day Fresno is made possible by many generous donors. The event is underwritten by AgWell Solar, The Fresno Bee, The Unitarian Universalist Church of Fresno, and the Valley Air District. For more information or event updates, please visit our website www.earthdayfresno.org and Facebook page. If you would like more information about this topic, please contact Esperanza Richart by email at publicity@earthdayfresno.org.